As we said before, an Earth-orbiting rotovator reaching down to the ground is probably unfeasible due to the drag of the atmosphere. However, you could use a bolo that only swings down to the top of the atmosphere in combination with a launch vehicle bringing payloads up to high altitude. Instead of going all the way into orbit, this rocket vehicle could follow a ballistic trajectory that would take it into space for only a short while. A satellite released by such a launcher at the top of its trajectory would of course also be suborbital, and thus fall back to Earth before circling the planet even once—unless the spacecraft would be picked up by the tip of the bolo tether at the bottom of its swing, at that moment exactly matching the speed of the satellite. The bolo would then sling the captured satellite to a higher altitude, giving it sufficient extra speed to stay in orbit as well. Since the launcher as part of this system does not need to go into orbit, it could be relatively small, simple, and consequently less expensive than conventional satellite launchers. What's more, because of the lower demands on performance and less severe mass constraints, it is much less difficult to develop a suborbital reusable launcher than it is to design and build a fully orbital reusable vehicle. It would therefore be sensible to employ a reusable launcher in this concept. Such a vehicle could shortly hop up to the right altitude, release and pass on its payload to the tether docking device that is swinging by at a suborbital velocity, and then fly back to Earth to pick up another spacecraft to be launched. Such a combination of a suborbital reusable launcher and bolo may be more economical than a stand-alone orbital reusable spaceplane (see also Rocket Propulsion Limits and Limitations in Chapter 2). A concept for a launcher-tether combination has been studied by Boeing, TUI, and the University of Maryland under the name Hypersonic Airplane Space Tether Orbital Launch System (HASTOL). It consists of a suborbital spaceplane, like the "hopper'' mentioned earlier in Chapter 2, and a rotating tether with a grapple mechanism. The spaceplane reaches a velocity of 3.5 km/s (2.2 miles/s) at its maximum altitude of 100 km (60 miles), where it releases the payload. If the spaceplane takes off from the equator, Earth's rotation gives it a free additional velocity of about 0.5 km/s (0.3 miles/s). The total speed of the released satellite is thus about 4 km/s (2.5 miles/s). The spaceplane's maximum speed is equivalent to Mach 12 (i.e., 12 times the speed of sound), which is a very high velocity for an airplane, but not sufficiently fast to stay in orbit because that would require about twice that speed. The spaceplane thus follows a ballistic trajectory that brings it back to Earth. Immediately after release by the spaceplane, its payload is picked up by a homing and grappling system at the end of a long rotating tether then flying through its orbital perigee. This bolo lifts the payload further into space and provides the additional speed the satellite needs to stay in orbit. Because the spaceplane needs to achieve only about half the speed required for an orbital vehicle, and because kinetic (movement) energy is equivalent to the square of the velocity, the amount of propellant it requires is about a fourth of what is needed for a conventional satellite launcher. To further decrease the amount of propellant that needs to be carried onboard, Boeing envisions equipping the hypersonic plane with engines that can use oxygen from the atmosphere for a large part of the flight. total bolo system to be put in orbit would thus have a mass of about 200 times the payload mass, obviously making many launches of sufficiently small sub-elements necessary (Fig. 5.10). The mass of the tether itself forms about 45 percent of the total rotovator mass, and is directly related to the cable's thickness. The required thickness, in turn, is strongly related to the rotation speed of the rotovator; the faster the rotation, the thicker the tether needs to be to avoid breaking, and thus the higher its mass. It is like twirling a rope with a stone attached over your head, where the tension also increases with the rotation velocity. If you turn the rope slowly, you can use a thin rope, but if you increase the speed you will need a thicker cable or else the stone will break free. The mass of the HASTOL rotovator tether can thus be substantially decreased by making the system rotate slower. The problem is that when swinging down to pick up the spaceplane's payload, the tether tip will not have sufficient backward speed to match that of its target. In other words, from the point of view of the target payload the tether tip is moving away too fast in the direction the rotovator is orbiting around Earth. tether quickly pulls taut and the tip will again follow the general rotation speed of the rotovator (Fig. 5.11). Tethers Unlimited calculated that with this "LIFTether'' concept the constant rotation speed could be reduced so that the tether tip's velocity would be 3.1 km/s (1.9 miles/s) instead of the 3.4 km/s (2.1 miles/s) needed for the normal rotovator. The 0.3 km/s (0.2 mile/s) difference in speed should enable the mass of the tether to drop to 526,400 kg (1,160 pounds)— a 60 percent reduction with respect to the normal rotovator tether, even with the bottom 20 km (12 miles) of tether made of titanium-coated silicon carbide to be able to handle the increased aerodynamic heat. Another way to minimize the tether rotation rate and thereby minimize the tether mass is to use a two-stage tether, with a "second stage'' spinning tether rotating at the end of a "first stage'' spinning tether (for example, around a stiff pivot bearing supported on both ends by a split in the first tether). 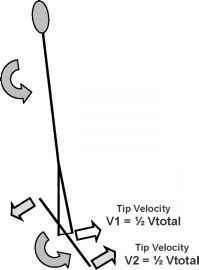 In this way the required total velocity of the second tether's tip can be achieved while each tether rotates at a much lower rate than required for a single-tether rotovator. The second tether must have two arms of equal mass extending both ways from the center of rotation for balance reasons. Moreover, the first tether will have to carry both the mass of the payload as well as that of the second tether, so the optimum mass distribution results in the first tether being much longer than a single arm of the second tether. For the basic rotovator the tether mass is about 90 times the payload mass it handles. Instead, for a two-staged tether where the required total tip velocity is split in nearly equal amounts over the two tethers, the combined mass of the cables could be as low as 20 times the payload mass. However, the downside is that the design and dynamics of such a two-stage tether is much more complicated than for a single-stage rotovator (Fig. 5.12). A fourth type of bolo system studied for HASTOL was the Cardio-rotovator proposed by Robert L. Forward, which involves a very long tether in an elliptical orbit and rotating twice each orbit. Different from the rotovator and LIFTether, seen from Earth the Cardio-rotovator tether would be oriented below the central facility at the system's orbital apogee, and straight above it at perigee. The resulting trajectory of the tip of the tether is approximately heart-shaped, which lead to the peculiar name of the system. Because the Cardio-rotovator's orbital speed is at its minimum when passing apogee, the system's speed relative to the target payload is lower than for a normal rotovator picking up its cargo at perigee. As a result, the rotation speed of the Cardio-rotovator needed to match the target's velocity is some 0.5 km/s (0.3 miles/s) less than for the normal rotovator or LIFTether in a nearly circular orbit. 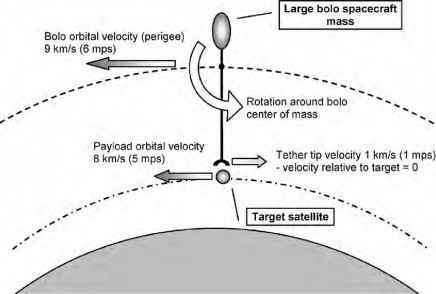 The mass gained by the lower rotation and hence lower tension is of course partly lost due to the longer tether that is needed to be able to reach the target satellite from apogee (Fig. 5.13). Figure 5.12: The principle of a two-stage tether that ach ieves the same total tip velocity as a normal, single-stage rotovator. Figure 5.13: Orbit and rotation of a Cardio-rotovator. However, the HASTOL study found two major problems with the Cardio-rotovator idea. The first is that picking up a mass at apogee decreases the total system's perigee altitude due to the momentum exchange principle and the orbital mechanics explained in Chapter 1 (see Orbits). For a normal rotovator, picking up a payload lowers its orbit altitude as well, but since it grabs its cargo at perigee the result is a decrease in apogee altitude. This is much less critical than the decrease in perigee altitude of the Cardio-rotovator, which can easily lead to an entry into Earth's atmosphere. TUI calculated that in order to avoid perturbing the orbit too much by picking up a suborbital payload, the Cardio-rotovator would need to have a mass that is 1000 to 2000 higher than the mass it picks up. Compared to the normal rotovator's mass of about 200 times that of the target payload mass, this is extremely high and completely negates the tether mass benefit of the slower rotation. The second problem is that the change in orbit resulting from picking up cargo alters the orbital period of the Cardio-rotovator; its new, lower orbit would make it circle Earth in less time. As explained before, the rotational rate of the tether is not affected, meaning that the next time the system reaches apogee the tether will not be pointed straight down to Earth anymore. The rotational rate of the Cardio-rotovator could be aligned with the new orbit by reeling in part of the tether, which would make it rotate faster (just like a pirouetting ice-skater spinning faster when she tucks in her arms). However, any failure in this would make the tether enter the atmosphere, resulting in a loss of the system. TUI's conclusion was that employing a Cardio-rotovator for HASTOL is not a good solution. The total mass of the orbital MXER tether in the HASTOL concept is high—about 200 times the mass of a single payload for the basic rotovator and still 145 times that mass for the LIFTether. This indicates that the HASTOL system makes sense economically only if it is used to launch many satellites on a regular basis. The basic rotovator starts to become more efficient than conventional rockets only after launching a minimum of 200 payloads of 15,000 kg; for any lower number of satellites, more rocket launches would be needed to put the rotovator in orbit than would be needed to launch the satellites directly! When we also take into account the development costs for the rotovator and the required spaceplane, the economic break-even point will be far over 200 payloads. The HASTOL concept thus suffers from the same catch-22 problem that haunts all reusable launcher concepts: their increased efficiency will make it possible to launch many more spacecraft for lower costs than conventional expendable rockets, but in order to become economically feasible they require a huge and stable satellite launch market. The relatively small satellite launch market of today does not warrant the huge investments needed to develop HASTOL into an operational system. Like MERITT and other large bolo concepts, HASTOL could enable large-scale cargo transportation from Earth to space and other planets, but requires much investment, development, and a considerably larger or at least fast growing launch market to become a reality.